Now shall my inward joys arise… – Sacred Harp singing in the San Francisco Bay Area. Our twice-monthly Sacred Harp singing in Palo Alto takes place on the 2nd and 4th Sundays, 2-4 p.m., in Room 1 of the Unitarian Universalist Church of Palo Alto, 505 E. Charleston Rd., Palo Alto, Calif.
For photos and videos of singings, check “Recent Posts” in the menu, or browse older blog posts by checking the Archives. 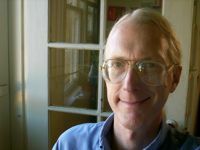 For more San Francisco Bay Area singings, see Bay Area Sacred Harp and Facebook events pages. 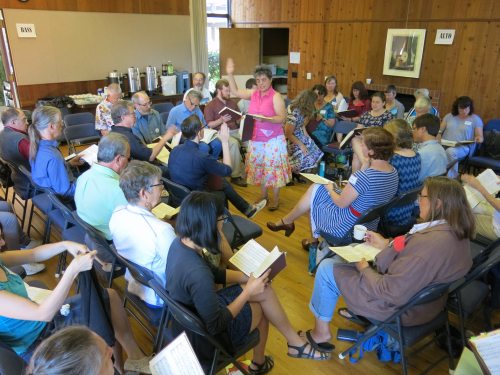 Please join us for the 6th annual Palo Alto All Day Singing, the Saturday before the 4th Sunday in August (August 26, 2017) — a full day of singing from The Sacred Harp, 1991 Denson edition. Registration begins at 9:00 a.m. and singing at 9:30. Dinner on the grounds at noon. There will be an informal dinner Friday night: meet at the Unitarian Universalist Church at 7:00, we’ll walk to the Green Elephant for inexpensive Chinese food ($12-18), and stop at Rick’s Rather Rich Ice Cream for dessert. Then spend ten minutes and help set up chairs for the next day! The Saturday social will be at Don’s house in downtown Palo Alto — directions available at the singing. Then on Sunday, 3 more hours of singing from the Denson book — we’ve been invited to give a public demonstration of Sacred Harp singing from 2-5 p.m. at All Saints Church, 555 Waverly St., Palo Alto. No experience necessary! Free and open to the public! We’ll lend you a Sacred Harp book! Directions: Highway 101 to exit 400C San Antonio Rd. headed south. Take first right onto Charleston Rd. Go 0.6 miles and the church will be on the right, just after the intersection with Middlefield Rd. 7:00 — Friday night social: Meet at the Unitarian Universalist Church. We’ll park there and walk across the street to Green Elephant for Chinese food ($10-15), then to Rick’s Rather Rich Ice Cream for dessert. 7:30-9:30 — Weekly Berkeley singing, All Saints Chapel, 2451 Ridge Rd., Berkeley. For more information, contact the chair, Terry Moore.